It may have been called the 2014 Kiteboard North American Championships, but it was the Europeans who reigned during this regatta. French competitor Julien Kerneur and British competitor Oliver Bridge kept their names at the top of the scoreboards consistently despite the inconsistent racing conditions throughout the week. Bridge took first overall in the kiteboard class while Kerneur took home the top spot for kitefoils, finishing eleven points in front of second-place finisher Nico Landauer. Demonstrating their versatile athleticism, both also gained podium finishes in the remaining fleet. 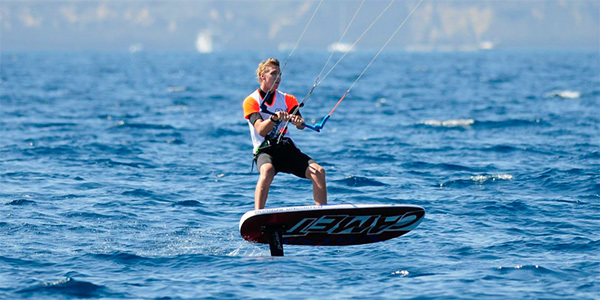 Kerneur finished second in kiteboards and Bridge took third in the kitefoil class. Bridge, who won each of the races in the kiteboard fleet said that today was the perfect end to a regatta. “It was great to win all four races in the formula class,” Bridge said. “It was good to end winning, it was good to end an event like that.” The winner of the kiteboard class is only 17 years old and has no intention of slowing down. 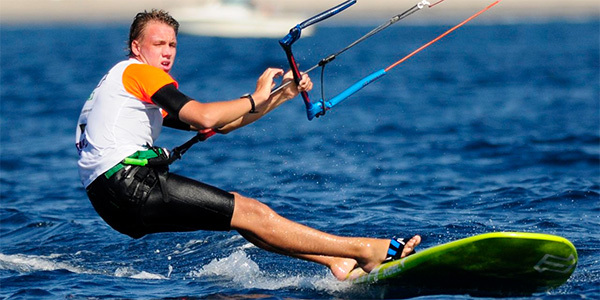 Next month, he will be competing in the ISAF Sailing World Cup Final held in Abu Dhabi. Kerneur, one of the most well-rounded competitors in the sport, had one of the cleanest campaigns possible. He raced a nearly perfect regatta, with eight first-place finishes and two second-place finishes. Both second place finishes were thrown out as his two lowest scores, leaving him with a total of eight points for the entire regatta. Winds finally picked up on the last day of racing, with lulls seeing speeds of 8 kts and highs of 11 kts. With stronger winds, the true test of the course came from the tricky placement of the kelp, and clever navigation ended up paying off more than just racing fast. “There was so much kelp near the top mark,” said veteran racer Bryan Lake. “Once I saw people were struggling in the water, I went up and all the way around. It ended up saving me a lot of time, that’s how I got third,” Lake said of Race 8. 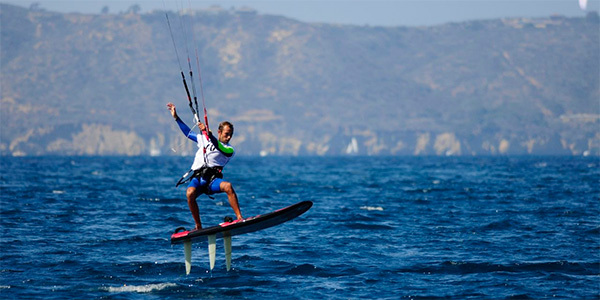 Also with two podium finishes is local San Diegan Nico Landauer, who ended the regatta in third for kiteboards and second for the kitefoil class. The occasionally light winds and heavy patches of kelp, the 2014 Kiteboard North American Championship ended up requiring a lot of smart racing in place of simply fast racing. 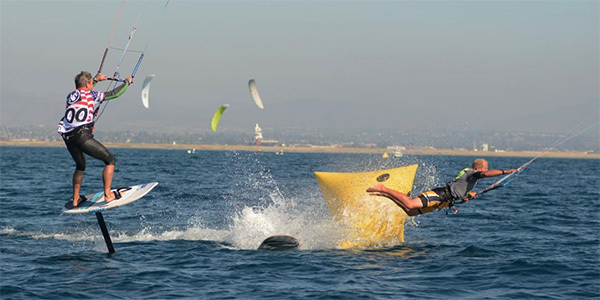 The technical maneuvering around both the race marks and obstacles in the water was a great display of what competitive athletes kiteboarders and kitefoilers truly are. To see the full results, individual race scores, pictures and aerial footage, visit www.sdyc.org/kiteboardna.